This is the 3rd in our series of customer stories, where we look at some of the inspirational journeys our customers go through on their way to becoming advanced drivers. You’ll remember that in our first customer story, we focused on former Motorbike racer Stef and his journey from track days in a BMW M4 to leading the 750MC Bikesports Championship in a Radical PR6. 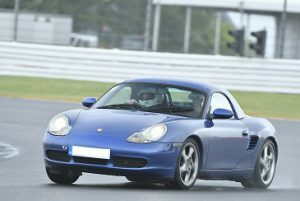 Then we had Mike, a 65-year-old complete novice to the track. We followed his journey as moved his way through our Academy Programme and competed in an Austin A35 in his first race earlier this year. So where to now? Well, in this piece, we’re going to be looking at a trio of drivers who come together regularly for a group development session with CAT. A Car Club day brings a whole new dynamic to the CAT Driver Training learning experience, so let’s find out more about our trio and how they got on. 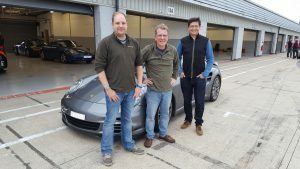 Jon, Nik and Chris – who came together with a group of other Porsche enthusiasts through the 911uk.com forum for a club day at Millbrook with CAT Driver Training. After the initial club day, the trio decided to get together and book themselves up for additional training days to really get to grips with their cars and understand how to safely drive them at their limits. Why did you book further sessions with CAT? Nik: After the Performance Driver ‘Track’ day, Cornering Masterclass and Group Drifting & Over Grip Limit Handling club day, we felt we wanted more time with Colin. We asked him if he could put together a bespoke day focusing specifically on the skills we needed to work on. He was able to do so (Group Optimisation) and so we continued with a number of sessions with him after that. Are there benefits to booking in a group? Our previous customer journeys have focused on individuals and their goals, so what’s it like sharing that valuable time on a training day with other people? Are there benefits? Jon: Yes, there’s a great camaraderie between us. We want each other to do well and we share what we learn with each other. Nik: Definitely. It’s a nice combination of learning and being social. The learning time can be quite intensive and so, when you are sharing Colin’s time with others, it gives you the option of taking time out to let the new information soak in and if you have the energy when on a track day, to go and put it into practice on your own. Have you previously received driver training outside of CAT? Jon: Yes, I had a session with an instructor at Castle Combe who tried to grab the wheel as we were going round the track… it was a very bad experience. Nik: I had some instruction at Goodwood. The instruction was ok, but nothing out of the ordinary. Can you share some of your key learning points? Chris: For me it’s the simple things. Looking through the corner at where you want to go to minimise driver input, and being able to move from the accelerator onto the brake as quickly as possible. Overall it’s been a really powerful experience, learning how and why my car behaves the way it does at high speed. Jon: Trail braking. 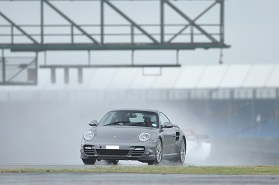 It’s something you have to do in a 911 to get the nose down as there’s no weight in the front. Once you learn this, the car really comes alive. Nik: Feeling the car’s balance, learning to feel the car when it’s on the edge and when it’s just about to lose grip. It’s enabled me to push the car further than I thought possible. What can you tell us about your experience here at CAT Driver Training? Nik: I have done a fair amount of teaching in my time and have experience of being taught. I can tell when someone knows how to teach. Colin is a really good teacher, across all disciplines. He’s got the technical, engineering, communication and people skills and he’s always very positive. “It’s very rare to find someone who has that level of teaching ability”. Chris: Colin has such a depth of experience. He really understands how and why a car behaves as it does and this proves invaluable when you want to drive your car on the limit. Jon: Colin has an amazing way of getting technical content out in a way which is easy to understand. What’s next for the three of you? All three: We’re heading off with CAT Driver Training on a group trip to SPA in October. For anyone interested in this trip – sorry to say we’ve been fully booked for a while, but make sure to send us an email at info@catdrivertraining.co.uk to register your interest for future events. Do you have any pearls of wisdom for our readers? Chris: Rather than spending vast amounts of money on components to make your car go faster, invest your money in learning the skills you need to drive your car faster. Booking a course with CAT Driver Training is money well spent and unlike shiny new components, those new found skills will still be in use many years down the line. Nik: It’s not just Colin, there’s a whole team at CAT Driver Training. They’re all very friendly and provide an efficient and quality service. That’s it from this piece. If you’re feeling inspired and would like to explore how you can take your love of driving to the next level, take action. Contact us today for an informal chat about one to one training or organising your own car club day on 01234 757 633 or email us at info@catdrivertraining.co.uk. Do you need to get your hands on a FHR or HANS Device?